Hammerworks WM212 Colonial Copper Wall Light features a unique bottom finial, setting it apart from similar styles. While these Colonial Wall Lanterns have a compact body, the addition of the top and bottom points give them a graceful look. Most notably, this Colonial Copper Wall Lantern is also available in a smaller model, the WM211. At just 19″ in height, this outdoor wall mounted fixture is a great option when space is limited. 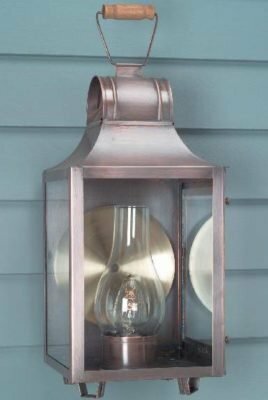 Furthermore, Traditional Wall Lanterns Small Sturbridge WML102 or Traditional Home Wall Lights WML112 combine nicely with this Colonial Copper Wall Light. For Primitive Style Wall Lanterns, look no further! Hammerworks offers several options. Colonial Reproduction Home Lights Barn Lantern W102 are especially popular. 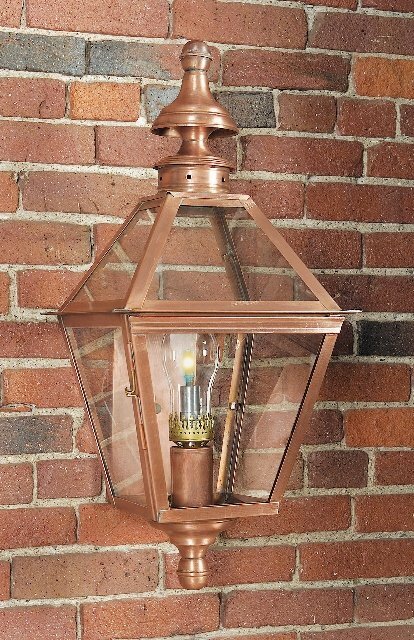 This attractive fixture is also available in a smaller model, Copper Colonial Wall Light Barn Lantern W101. If you prefer a metal grid or crossbars on the light, consider Colonial Reproduction Wall Light Garrison WM110. Likewise, Colonial Reproduction Wall Lantern Williams W104 is another interesting option. With so many choices, we cannot name them all here. 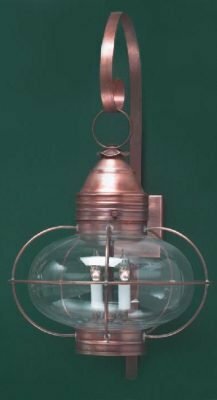 Take some time to browse our website to find the Colonial Copper Wall Light that’s right for you! In addition to our collection of Colonial Copper Wall Lights, you’ll find several matching handcrafted Colonial Post Lanterns. Above all, we offer many traditional and primitive Early American styles. These include the customer favorite Colonial New England Style Copper Post Lantern Large Sturbridge P101. This classic looking post mounted light is also available in a slightly smaller size, Model P102. Other popular designs include Cape Cod Style Post Lantern P110 and Colonial Boston Post Lantern P103. No matter which handcrafted reproduction post light you choose, you can be sure of receiving a superior quality light fixture made to last for generations.